Our waterfowl mainstay is Canada Geese. In November-January, these birds are roosting on the Missouri River and the Niobrara river. We have fields strategically located between the two roosting areas which are about 15 miles apart. The geese get up in the morning and fly from roost to field. We hunt them mostly in the fields, but we also hunt them over water on occasion. Mallard hunting is great in or area but only in November and it is highly subject to migration. You can always count on the Geese. Combines well with: Pheasant, Predators, Turkey and Buffalo. 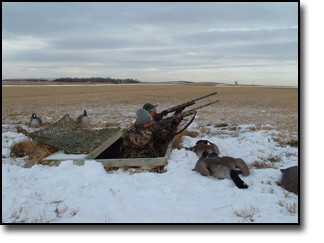 Hunt between two waterfowl refuges!